Self-expandable metallic stent (SEMS) is widely used for the colon cancer obstructions in palliative treatment or as a bridge to elective surgery. The technical and clinical success rates for SEMS placement are 75~100% and 84~100%, respectively. But the complications of SEMS placement such as perforation, stent migration, re-occlusion, bleeding and pain may happen. 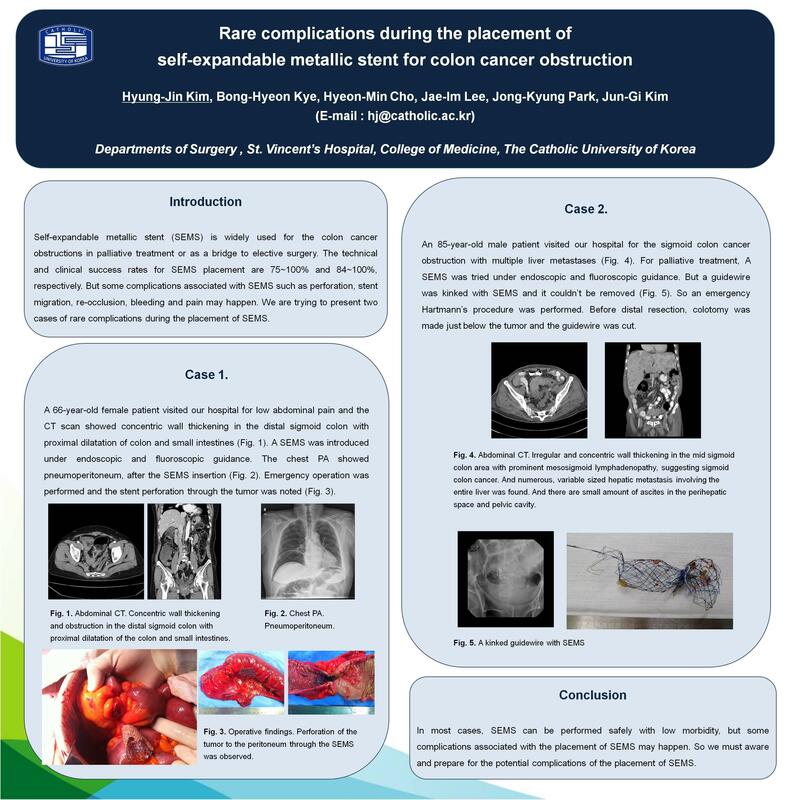 We are trying to present two cases of rare complications during the placement of SEMS. Case 1. A sixty-six female patient visited our hospital for low abdominal pain and the CT scan showed concentric wall thickening in the distal sigmoid colon with proximal dilatation of colon and small intestines. A SEMS was introduced under endoscopic and fluoroscopic guidance. The chest PA showed pneumoperitoneum, after the SEMS insertion. Emergency operation was performed and the stent perforation through the tumor was noted. Case 2. A eighty-five male patient visited our hospital for the sigmoid colon cancer obstruction with multiple liver metastases. For palliative treatment, A SEMS was tried under endoscopic and fluoroscopic guidance. But a guidewire was kinked and it couldn’t be removed. So an emergency Hartmann’s procedure was performed. During the operation, colotomy was performed and a guidewire was cutted. In most cases, SEMS can be performed safely with low morbidity, but some complications associated with the placement of SEMS may happen. So we must aware and prepare for the potential complications of the placement of SEMS.